You may have heard a fairly substantial snowfall swept through the southeast Tuesday dropping anywhere from 1-3 inches of snow in greater Atlanta where I live. For those of you living in a mountain region in the west or north of the Mason-Dixon line in the east it’s OK to scoff. I grew up in Ohio so I know a major snowstorm when I see one. Except for Southerners it is. We simply don’t have the equipment to deal with the road conditions as they deteriorate. Still fewer drivers with experience in snowy road conditions. This storm left many motorists stranded and children stuck at school throughout the night. Many roadways are still a parking lot this morning, as ice developed overnight in the below 20 degree weather. There is a wide range of emotions produced on a days like this. I’ve noticed that which one people express depends on their situation and who they are. Furthermore, and more importantly, how people deal with the situation and handle their emotions may influence how they view the outcome of the entire day. The post-panickers were out of the loop and didn’t see it coming. They postponed making plans and are now scrambling. They can’t get to the store now (or home from work) if they wanted to. Unfortunately, some of them in panic to get home, drove faster than they should have and produced a car accident. Perhaps being more proactive in their preparation may have eliminated some unnecessary grief. So today those who fall in the panic category are either patting themselves on the back or kicking themselves for not being prepared. I’ll admit to feeling a sense of excitement when the snow started to fall. 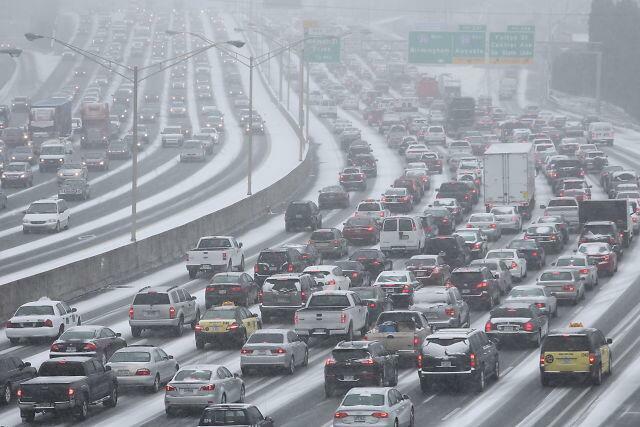 I’ve been in Atlanta for 18 years now and have grown to miss seeing the snowfalls I remember as a child. Something about the beauty of it sticking to the trees and the crunch beneath your feet produces a warm feeling inside of me. My feelings of excitement however, were insignificant compared to the pandemonium that took place in the hallways at school. Students were rushing to the windows during class breaks, giggling at the first few flakes that began to fall. So much excitement over something we don’t often see here. That excitement bubbled over as school was dismissed early and notification went out that classes were cancelled for Wednesday. If the excitement bubbled over when we left school, it erupted when our car pulled into the driveway at home. Within ten minutes my kids were in hats and gloves ready to enjoy an afternoon like none they have seen (at least not my youngest). There enjoyment of this weather event will live in my memory (and in pictures) for a long time. So, from an excited child’s perspective, the day could not have been better (unless you were one of the unfortunate ones who couldn’t get home and had to spend the night at school. Ugh…). Pressure is a part of life. We face it every day in some form or fashion. Some people thrive on it. It locks others down and forces poor decisions. In early January, our local school system closed for two days due to extreme cold and the threat of snow. The cold came but the snow didn’t. We easily could have been in school both days. I heard the county caught a lot of heat from parents for that decision. So this time around they decided not to cancel school, even though the chance of snow was 100% starting at noon on Tuesday. Oh, did I mention all the other surrounding counties had already cancelled school on Monday night? Seems like an inconsistent message being sent by the school system in regards to student safety. So what happened? Why not call off school with all the risk? I can’t help but believe the second decision was influenced by the negative feedback received from the first decision. Not wanting to face the backlash again, they chose to stay open. So we had to dismiss school in the middle of the day Tuesday, a logistical challenge in itself. I wonder how put out the parents will feel and what negative feedback they will give the county school board over this decision. Pressure can make us do some weird and uncharacteristic things. Life events produce emotions. How we respond to them can shed some light into how we plan, how we receive news and how we make decisions. I, for one, am going to enjoy this day and help my kids build a snowman. After all, we don’t get to experience this very often. Into which panic category do you normally fall – planner or reactionary? How do you respond when pressure hits? Do you rely on decisions made in the past or focus solely on making the best decision in the present situation? Next Post: Why Does Toys R Us Want My Phone Number? Pre-panicker here! I stress myself out about things that sometimes never even happen. My mom is also a natural worrier so I think it I get it from her. It’s something I’m trying to do less, since the stress definitely isn’t good for me or my mental or physical health. Every time I envision what could happen (especially when facing an awkward or potentially confrontational conversation with someone) it never ends up turning out the way I imagined. Makes me feel silly I fretted over nothing. I am one of those people who almost never get below a quarter of a tank of gas and have jumper cables and a portable air compressor in the trunk in case I get a flat. Sadly, I learned to be that way through experience. That is one thing I certainly don’t miss about the south; how things shut down with the hint of winter weather. At least in Colorado, you go regardless. Kids play on the playground unless it’s below 10 degrees, but they are required to have boots, snowpants, hats and gloves with them at all times in the winter. Maybe living in a winter climate part of the year makes you more of a planner? Isn’t it funny how one weather event can affect people so differently? I probably would be giddy too because I have not seen snow in a long time either. At least not snow you don’t drive to on purpose. I also lived in Seattle and people didn’t know how to drive in the city there either, even though people went weekly up to the mountains to ski and snowboard. 🙂 I’m a cautionary planner. I practice awareness, but try not to let it get the best of me. I worry too much about things so this is how I try to avoid MORE worry. I plan ahead but don’t get out of control with it. We can practice too much awareness and it gets the best of us. Like everyone who was hoarding supplies for Y2K…and then nothing happened. We’re up in Michigan, and my wife can’t fathom that this amount of snow could shut down a city and reduce commute to a standstill. I have to point out the things that you mentioned, that they don’t have a team of plows and salt trucks, and that the drivers don’t have any idea what to do when there’s snow on the ground. Driving in the snow is second nature here, but I definitely see how this was catastrophic. I remember those Midwestern winters all to well. Like you said, nobody thought driving in the snow was a big deal. I’ve only seen two vehicles leave our subdivision today, both trucks. I am pretty good under pressure and flexible enough so most events don’t have a big impact. I was stuck in a snow storm last year, so got out of the airport, enjoyed a night with a cousin who lived nearby and I never see, and ended up driving with him instead to my destination. With less time, kids, etc. I’d probably be in panic mode. Enjoy the snow! “…flexible enough so most events don’t have a big impact.” That’s a great point Pauline! Being flexible goes a long way in shaping our attitude (for good or bad) when events don’t go as we planned. Really enjoyed this post. It’s very easy for us in the Midwest (especially here in Minnesota!) to scoff at how people in the warm parts of the country react to snow. You make a good point, though, that without the proper equipment the snow likely just gets compacted and turns into ice, making it that much more dangerous. I also have noticed how different I drive in the snow/ice than when it’s warm out. Not that I’m inattentive when it’s nice out, but I’m far more conscious of how the ground feels under my tires when it’s cold and there’s snow and ice out. I also look very closely in front of me to be more aware of the condition of the road I’m about to roll over. If you aren’t used to driving like that I’m sure it doesn’t come naturally. As far as being a planner or reactionary, I would say learning how to react and adapt to situations is crucial. Most people simply don’t have time to be fully prepared for every potential hazardous situation or every situation. I try to plan as much as possible – you should see my notebooks with to-do lists and plans and whatnot, but honestly I run-out of time. Knowing the limitations of time, I think that being able to prioritize is absolutely key. I have no idea about the inner workings of the GA DOT. It would seem to me they did not have their prioritize lined up or at least planned out well. There should have been salt on the major arteries by 11 AM, an hour before the weather hit. I was thinking about you last night when we were watching the news and they were talking about Atlanta. I grew up in Richmond, so I remember how many people freaked out at the thought of an inch or two of snow. We even had days where they called for snow, they canceled school and never got a flake. I think so much of it is relative as people here in Omaha are used to getting dumped on. That said, I’m more of a planner though we usually have enough things in the house that we can get by for up to a week so we just roll with the punches. We made it home fine. I only live about ten minutes from school and made it out before the tough conditions set in. We are out in the suburbs so don’t have to deal with the downtown traffic…thankfully. Nobody is out traveling this morning…haven’t seen one person leave the subdivsion. With the cold temps and icy conditions we will probably be snowed in tomorrow as well. I am more of a planner, though I still stress about driving in the snow and getting to work. There were a lot of times school was closed only for nothing to happen, and when snow did hit, we were open. It was pretty annoying, but I don’t think anyone ever got stranded there. That’s awful! Glad your kids got to enjoy it though. Snow was much more fun back when I didn’t have to drive! Yeh…being stranded at school is pretty tough. I heard a cool story this morning though about a dad who walked six miles to his 5-yr. old daughter’s school so that he could spend the night with her and she wouldn’t be scared. That’s an awesome dad. Kids were stuck at school overnight? That’s insane! It was a really bad situation. Poor management by the local school systems to even allow kids to be at school on Tuesday. Then everyone (schools and businesses) released at once (around noon) and nobody could get anywhere there was so much traffic.